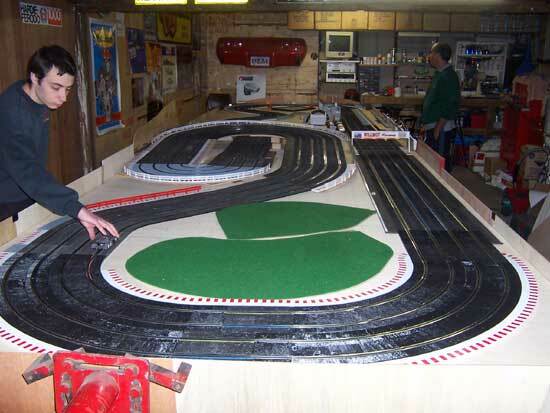 Willmot raceway has moved to colyton and has replace CRW, here are some pictures of the track being re-built by boslot and vinno. still a fair bit of work is left to get the track ready for racing, it should be wired up ready to run by thursday night. 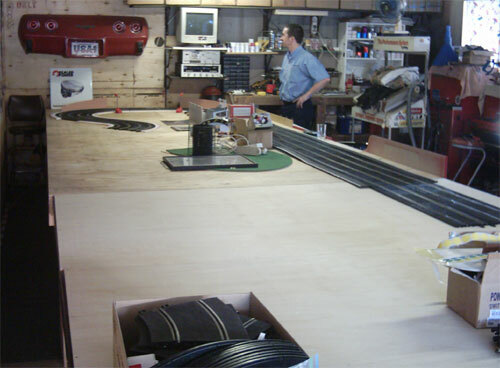 Joe has finished the wiring harness already which will connect up the track jumpers and the driver stations. Bo is currently working on the bridge and laying borders. 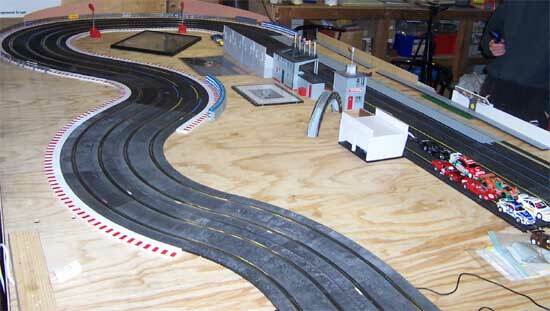 He is trying hard to have the track running for a test race on Friday night. 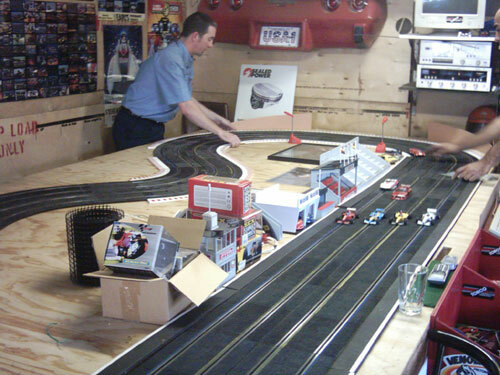 The layout is the same although a 400mm longer table with a the widest radius Ninco curve now at the end of the main straight and the inner curve kink leading onto the bridge now also changed to outer and double outer. 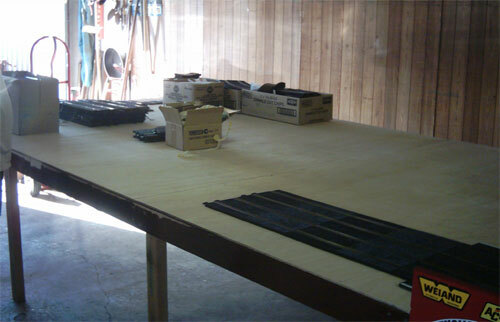 The table is also wider which will make for a faster track. 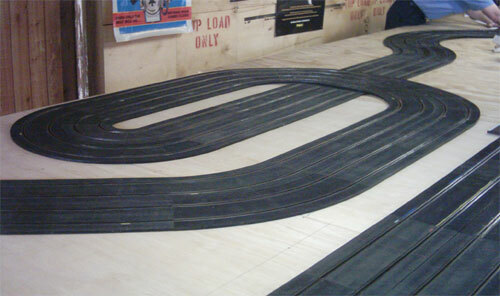 The straight is 21 feet in the old scale. We are looking forward to running on Friday night. Looking good guys! Can't wait to get back there and have another run! 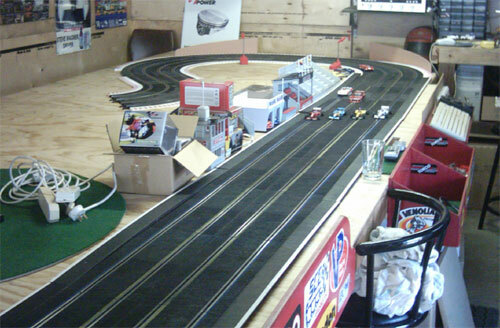 The track has been wired up now, at the moment 2 lanes are working, theres a dead spot with 1 lane and because the bridge is still being built another lane can't be used, but it will be ready to race before the next round. more work will be done on it tomorrow and hopefully another lane will work. Looks great my trigger finger is starting to get ichy. "I feel the need, the need for speed". I hear this track is a little longer than the old Willmot one so all the old records are gone. Gonna be a busy 2005 then for Joe to reclaim King of the Hill! Here are a couple of progress shots of the track as of Monday night. As you can see Bo is yet to remove the Corvette from the back wall. He backed it through a year ago and cant afford the tow truck to pull it out. We are going to have two races on Friday night. One for Ninco Porsche 934's with NC1 engines fitted with Ninco adaptors. The cars are otherwise unaltered and have no weight added. 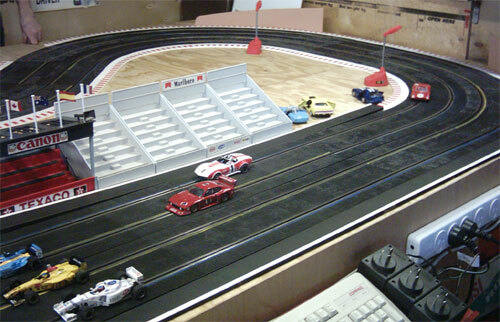 The other race is for Scalextric Trans Ams. These will be the same rules as run at Armchair Racer. Stock with bar magnet removed and a button magnet fitted to the front magnet pod. I won't be racing that class Bump me old boy. Couldn't part with the cash to buy something like that. Bikes are meant to lean so I wont go there. Dave's cars lean If he can't fix it, no-one can.